This article explains how to resolve conflicts when inheriting default methodsClick to Read tutorial explaining Java 8’s new default methods with same signatures from multiple interfaces using java 8’s conflict resolution rules. 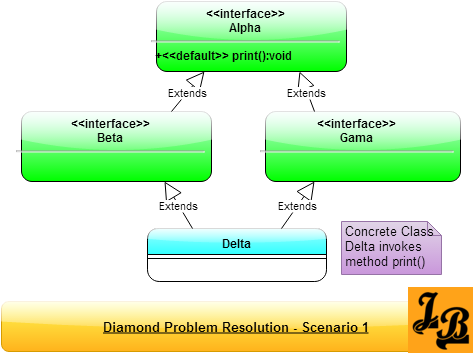 It then looks in to the classic Diamond Problem and its resolution in Java 8. Read tutorial on Multiple Inheritance in Java 8 of behavior using default methods. However, what-if the multiple default interfaces implemented have default methods with the same signatures. Then which of the default implementations from the many parent interfaces will be invoked in the implementing class. Java 8 designers have thought of this conflict and have defined resolution rules for such scenarios. Let us now take a look at the possible conflict scenarios and the resolution rules in-built in Java 8 for avoiding them. Rule 1 – Classes take higher precedence than interfaces – Any method inherited from a class or a superclass is invoked over any default method inherited from an interface. 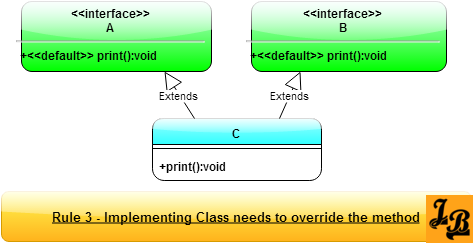 In the above class diagram, Class C inherits default method print() from interface A, interface B and super class C. If print() method is invoked in Class C then the implementation in super class C is executed. Rule 2 – Derived interfaces or sub-interfaces take higher precedence than the interfaces higher-up in the inheritance hierarchy – If default methods with the same method signature exist in an interface and its child interfaces, then the default method from the child interface is invoked. In the above class diagram, interface B inherits from interface A. Both have a default method print() with the same signature. Class C implements both interfaces A & B. 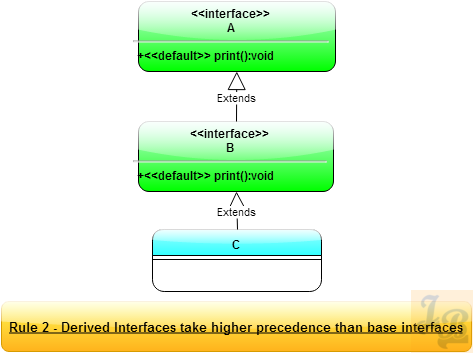 When print() method is invoked on an instance of class C then the implementation in interface B is invoked as it is the lowest child/most derived interface in the inheritance hierarchy. Rule 3 – In case Rule 1 and Rule 2 are not able to resolve the conflict then the implementing class has to specifically override and provide a method with the same method definition – The implementing class can, of course, invoke the specific default method from the specific parent interface to get desired behavior. But still the class needs to override and invoke the default method to resolve the conflict. In the above class diagram, class C inherits from interfaces A & B, both of which have the default implementations of print(). Since, both interfaces A & B are parents of C, they are at the same hierarchy level, and hence, C has to provide its own implementation of method print(). In the above class diagram, interfaces Beta & Gama implement interface Alpha. Class Delta is a concrete class and it implements both the interfaces Beta & Gama. The question in this scenario is that if Delta invokes the print() method, then which one will be invoked – the one inherited from Beta or that which was inherited from Gama? (On a side note – If one sees the 4 inheritance arrows marked “extends” then they form a diamond shape and hence the name Diamond Problem). Java 8 resolves this situation by considering that there is only one implementation of print() method, which is in class Alpha. Hence, when Delta invokes print() then the implementation of print() in Alpha is executed. In the above class diagram, interfaces Beta & Gama implement interface Alpha like in scenario 1 above. However, here both of them override the print() method of Alpha. Now, when Delta wants to invoke print() which instance of print() will be invoked, the one inherited from Beta or the one inherited from Gama? The answer lies in Rule 3 of the conflict resolution scenarios described earlier in this tutorial. Delta will have to override print() method and explicitly invoke the print() method on one of its parents – Beta or Gama. This will resolve the issue. In this tutorial we looked at what do we mean by conflict resolution when inheriting behavior from multiple interfaces using default methods and rules defined in Java 8 for resolving these conflicts. 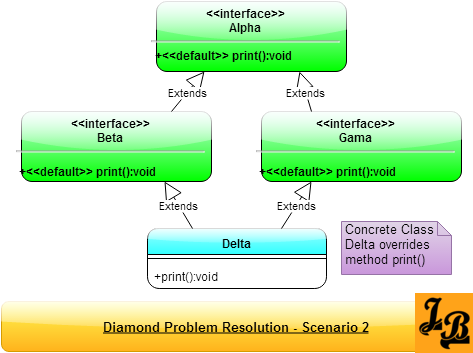 We then looked at couple of scenarios how Diamond Problem can occur in Java 8 along with how to resolve them in Java 8.